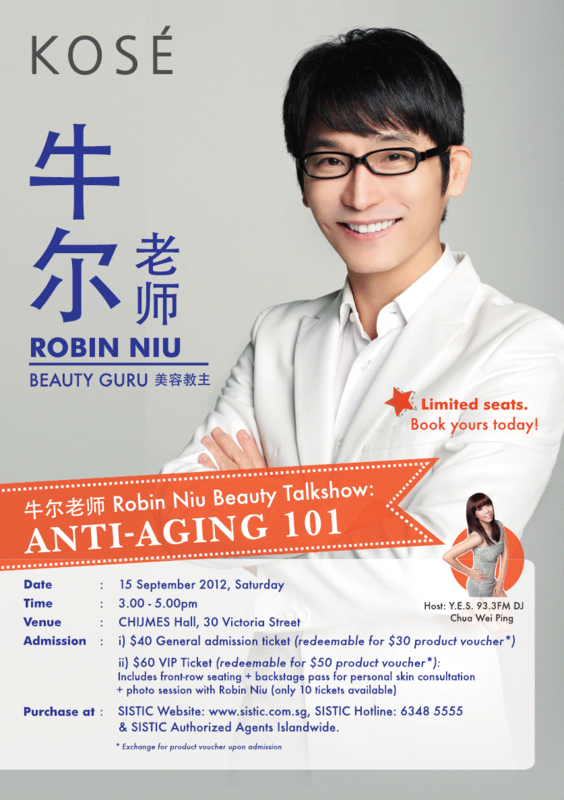 I am so excited for I am going to my first ever beauty talkshow by renowned Taiwanese Beauty Guru – 牛尔老师 ROBIN NIU BEAUTY TALKSHOW: ANTI – AGING 101, courtesy of KOSÉ Singapore and OMY.SG! Back by popular demand, Taiwanese Beauty Guru, Niu Er, is in Singapore again! With 18 years of experience in the beauty line, he is here to teach us how to achieve youthful-looking skin. Uncover his tips on how to defy the effects of aging to create radiant skin using a holistic skincare regime – INFINITY. Since KOSÉ’s launch of the INFINITY anti-aging skincare range in 2010, ladies who seek to improve their skin tone, texture and firmness have enjoyed tremendous transformation. In September 2012, KOSÉ will be launching INFINITY Prestigious. This new series targets women who are concerned about sagging facial features, wrinkles and lack of firmness in their skin. Seeing him right before my eyes working his magic and sharing his beauty tips is enough to drive me nuts (the good way, LOL)! I love laughing and smiling and I ADOREEEE my smiling-lines but as age catches up, I realise there is no way I can get away with normal beauty regimes. Even though a lot of people commented I look a lot younger than my actual age, that does not mean I can take this for granted. Time and tide waits for no man and your skin will tell! I can’t wait to learn how to keep those skin younger, firmer and “cheat” time! 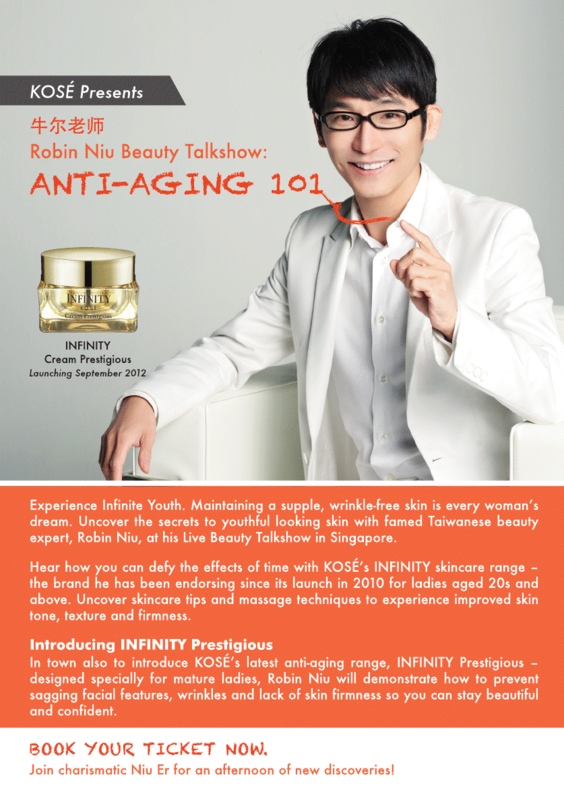 Teacher Robin will also be sharing KOSÉ latest INFINITY prestigious – designed for mature ladies! PERFECT!!! I believe you and I have always watched him on “Nu Ren Wo Zui Da”- “Ladies First”, and what better way than to grab this opportunity to catch him LIVE! Want a picture with the beauty Guru himself? NO PROBLEM! Don’t believe me? Read on and I will tell you how to make that dream come true. Tickets can be purchased at http://www.sistic.com.sg and SISTIC authorised agents. You can also call SISTIC hotline 6348 5555. Click here if you need any more information, you wouldn’t want to miss this! I’ve gotten my ticket, have you?